I want to thank everyone for being such great followers, fans and readers during this unforgettable record-breaking season. Hope you enjoyed all the smart stats, #FunFacts, Obscure Yankeemetrics and other interesting numbers. Let’s Go Yankees. In the first-ever Division Series matchup between 100-win teams, the 108-win Red Sox took the series opener, 5-4. It was another frustrating and winnable game for the Yankees, who struck out 13 times and left 10 men on base in the one-run loss. 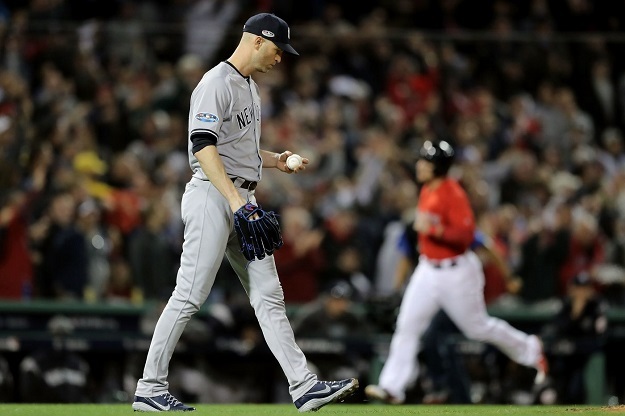 This was the ninth time in franchise history the Yankees lost a nine-inning postseason game by a run while stranding at least 10 baserunners — and the first time ever they also struck out more than 10 times in the game. J.A. Happ, who had been so brilliant against Boston this season (1.99 ERA in four starts) and during his entire career (2.98 ERA in 21 games), was pounded early and pulled in the third inning without recording an out, getting charged with five runs on four hits. He is the first Yankee starter in the postseason to allow at least five runs and while pitching no more than two innings since A.J. Burnett in Game 5 of the 2009 World Series against the Phillies. Before Happ, no other pitcher in franchise history had done that in the opening game of a playoff series. The Yankee chipped away at their early 5-0 deficit but their rally fell just short as Aaron Judge’s solo homer to lead off the ninth inning was followed by three straight strikeouts to end the game. The home run was a significant one for Judge, his sixth in 15 career postseason games. The only Yankee to hit more dingers in their first 15 playoff games was Bernie Williams (7). Giancarlo Stanton was part of the strikeout parade in the ninth inning, and finished with four whiffs in the game. A Stantonian #NotFunFact to chew on: He is the only cleanup hitter in franchise history to strike out four or more times in a postseason game. The Yankees rebounded from Game 1’s bitter loss with a fired-up, fist-pumping win on Saturday night to even the series at 1-1. They probably couldn’t have been in a better situational spot to steal a game at Fenway, facing David Price, a perennial Yankees punching bag with a historically terrible postseason resume. And both those narratives played out perfectly for the Yankees. 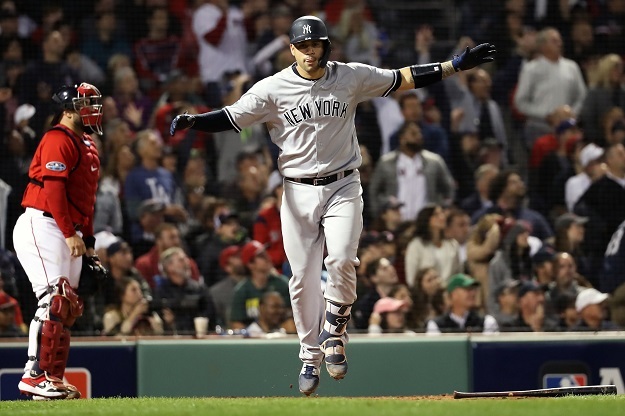 Aaron Judge and Gary Sanchez both crushed home runs while Andrew McCutchen chipped in with a booming RBI single, before Price got the hook and was booed off the mound in the second inning. The final damage for Mr. Price: 1 2/3 innings, 3 runs, 3 hits, 2 homers, 2 walks, 0 strikeouts. Price has now made 10 starts in the postseason and his team has lost all 10 of them. That is the longest postseason streak of team games lost in a player’s starts in MLB history. Okay, back to the Bombers. Judge’s first-inning solo homer was his third in three games this postseason. He is the second Yankee to go deep in each of the team’s first three games to start a postseason, along with Hank Bauer in the 1958 World Series. And he also joined Bernie Williams (2001, 1996), Reggie Jackson (1977) and Bauer as the only Yankee outfielders to homer in three postseason games in a row. But Price wasn’t the only Red Sox pitcher that got schooled by Sanchez on Saturday. He pulverized an Eduardo Rodriguez fastball literally out of the ballpark. With a projected distance of 479 feet, it is the longest hit at Fenway since Statcast tracking began in 2015 and the second-longest hit in the postseason at any park over the last four years. With his two homers, he entered into some purdy good company. He and Yogi Berra (1956 World Series Game 7) are the only Yankee catchers with a multi-homer game in the playoffs. And, at the age of 25 years and 308 days, he is the youngest catcher to homer twice in a game in MLB postseason history. Masahiro Tanaka bounced back from a couple bad starts to the end the season with another postseason gem, giving up one run — via the #obligatoryhomer — in five innings. He now owns a 1.50 playoff ERA, the fifth-lowest by any pitcher with at least five playoff starts. 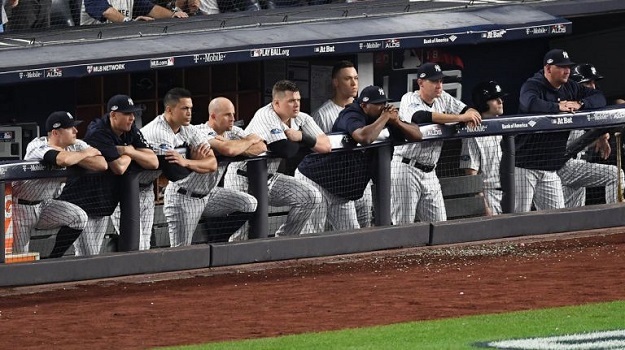 There really are no words that can capture the utter humiliation, indescribable embarrassment and overwhelming atrocity that was Game 3 in the Bronx on Monday night. Mike did an excellent job summing up the terrible managerial mistakes from the 16-1 loss, I’ll just present here the cold hard ugly facts. Luis Severino: 1st pitcher in Yankees history to allow 6+ Runs and 7+ Hits in an outing of 3 IP or fewer in postseason game at Yankee Stadium. It’s a game of inches, and the Yankees were just a few short in Tuesday night’s 4-3 loss. Folks, I hope you’re sitting down for this series-ending Obscure Yankeemetric … It was the 14th time the Yankees have been eliminated from the postseason at home, but the first time it happened in a one-run game at the Stadium with the winning run on base when the game ended. Welp. For the second straight night, Yankees found themselves in early hole, after CC Sabathia allowed three runs in the first three innings, a rare mediocre outing for him given his postseason track record in the Bronx. This was his eighth playoff start at home as a Yankee, and the first one that he gave up more than two runs. His 1.61 ERA in his previous seven home postseason starts was the second-best by any Yankee (min. 4 starts). In a season where #toomanyhomers was a nightly trend on Yankees twitter, the team failed to go deep in the fateful final two games. The only other time this season the Bombers were homerless in back-to-back games in the Bronx was April 7 and 8 against the Orioles, the fifth and sixth home games of the season. That’s baseball, Suzyn.